It is located on the 12th km of the main road linking the Chora of Naxos with the interior. 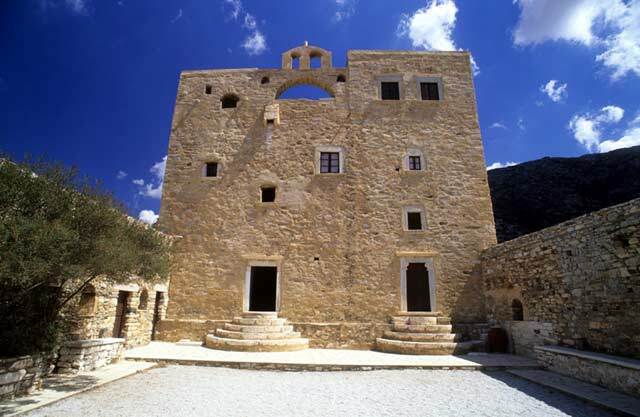 It was built circa 1600 and served as a monastery of the Holy Cross until the beginning of the 19th century, when it was abandoned by the last monks and devolved upon the then emergent Hellenic State. In the late 19th century it was purchased by the Bazeos (Basegio) family, to whose descendants it belongs until today. Since 2000 exhibitions are organized in the tower’s interior, while the FESTIVAL OF NAXOS, which includes concerts, theatrical performances and cultural activities, is organized in the forecourt from July to September. In 2008 the thematic axis of Festival is “Art and Madness”. Email: info@bazeostower.gr - Τel. 0030 22850-31402 (Naxos), 0030 210 7258741 (Athens).